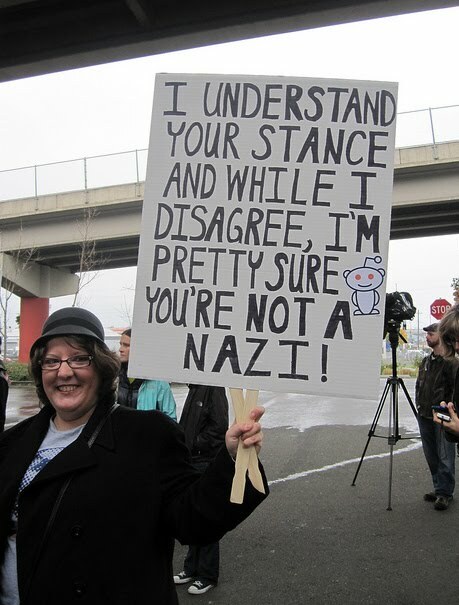 It was an American rally, but I think we'd all be better off if we heeded Jon's message in Canada too. In case you missed it, a trio of by elections were called last weekend. 1. Vaughan: Mayor Maurizio has won this riding easily in recent years, and defeated Richard Lorello 49% to 34% in 2008. 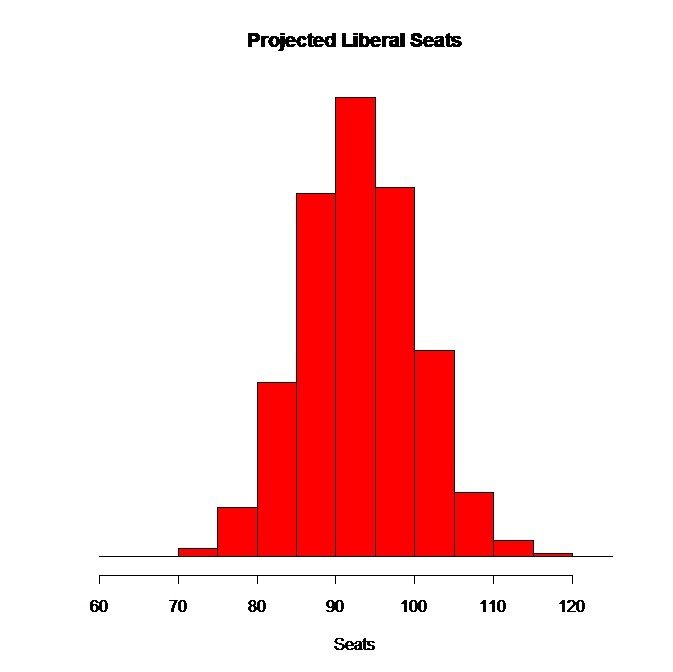 My seat projection system gives the Liberals a 91.4% chance to hold Vaughan during a general election, but this is a by election - a by election featuring a legitimate star candidate in Julian Fantino. Yes, I know the term "star candidate" gets used to describe anyone who has ever run for student council, had an op ed published in their local paper, or appeared as an extra on Road to Avonlea, but Fantino is legit. He's a former OPP Commissioner and Toronto Chief of Police, and is well respected in Vaughan. He's someone Stephen Harper would dearly love to have at his side when talking about Conservative "tough on crime" policies. Taking on Fantino will be Liberal candidate Tony Genco, the former CEO and President of Downsview Park (a site that hosted both the Pope and the Rolling Stones...sadly not at the same time). This has the makings of a good fight, with the Tories likely the slight favourites. Winnipeg North: This seat was formerly held by Judy Wasylycia-Leis, the name that everyone loves to say three times real fast. Trying to fill Judy's shoes for the orange will be educator Kevin Chief. Chief's chief competition will come from Liberal nominee Kevin Lamoureux, a man who makes up 50% of the provincial Liberal caucus in Manitoba. Also in the mix is Tory candidate Ray Larkin who was defeated by Wasylycia-Leis 63% to 22% in the last general election Julie Javier. 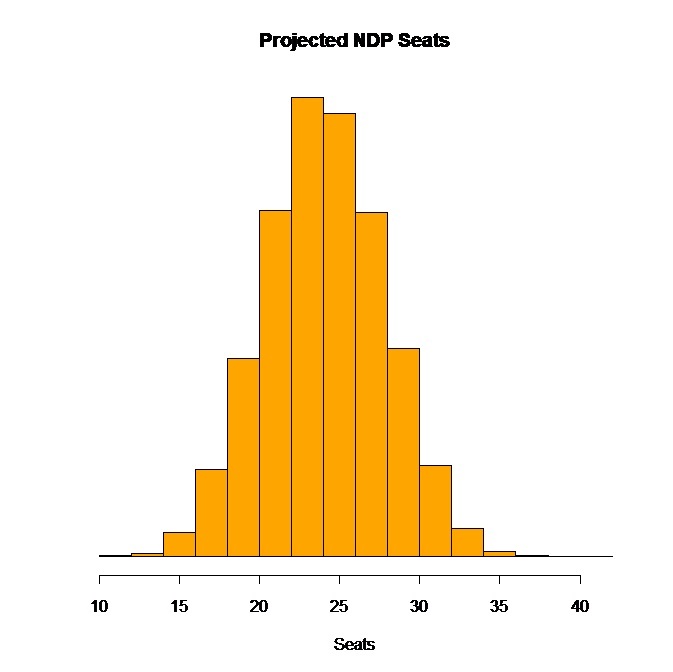 The projection model gives the NDP a 96.4% chance at holding the seat, with the Tories at 3.5% and the Liberals 0.2% longshots. Again, that's for a general election and anything can happen in a by election. Dauphin-Swan River-Marquette: This has been Inky Mark territory since 1997. Like Judy, Mark gave up the glories of life on the back benches for municipal politics and, like Judy, he went down in defeat on Wednesday. Mark won the last election by 45 percentage points and my seat projector has the Tories at a 100% chance of holding it in a general election. So, to put it mildly, the challengers have their work cut out for them. Especially since neither the Liberals nor the NDP have nominated a challenger as of yet. The Tory candidate is Robert Sopuck, who "has earned a solid reputation as an outspoken advocate for Manitoba’s rural communities". If elected, Sopuck would help the Tories cut into the NDP's long standing facial hair dominance in parliament. The City of Toronto has released the poll-by-poll election night numbers and the result is no surprise - if you live in pre-amalgamation Toronto or on a subway line, you likely voted for Smitherman. If you're a surburban type who drives a Ford, you likely voted Ford. Winnipeg breaks the anti-incumbency craze sweeping the nation, returning Sam Katz to office, despite the fact that he kicks children in the face. Going down in defeat is former NDP MP Judy Wasylycia-Leis. Elsewhere in Manitoba, former Reform/CA/DRC/PC/CPC MP Inky Mark loses by 36 votes in Dauphin. This leaves Maurizio Bevilacqua the only winner among the three MPs who jumped to municipal politics this fall. 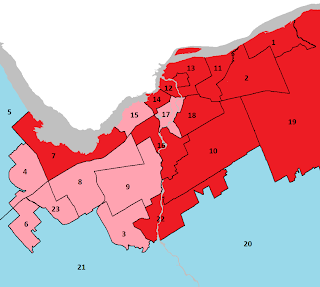 UPDATE: I should add that former Liberal MPs Ken Boshcoff and Joe Fontana won their races on Monday. Though for Boshcoff (defeated in 2008), it was only for a council spot and for Fontana, it was his second attempt at the top job since resigning in 2006. A great interview between Calgary's new mayor and Peter Mansbridge. 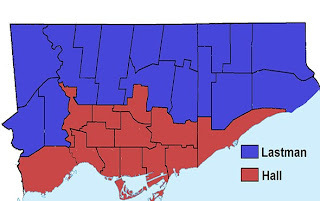 I'm not sure a thorough post-mortem is required for yesterday's election in Toronto. 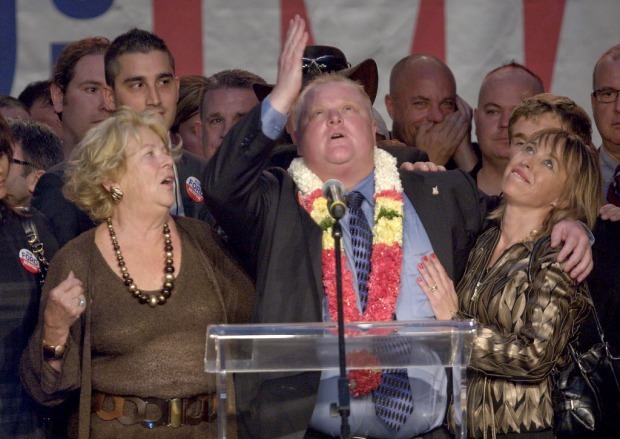 Much has been written about Rob Ford in recent weeks and it's fairly easy to understand what happened. It was simply a case of Ford being the right person with the right message at the right time. Politics is usually as simple as that. But since people usually try to make it a lot more complicated, let's take a quick look at what this wasn't a case of. 1. 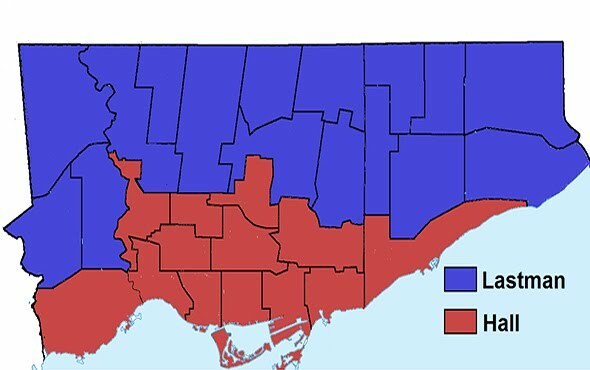 It wasn't a case of Toronto suddenly becoming more conservative. Calgary has had Liberal mayors for 20 years without electing a single Liberal MP. So I wouldn't take this as a sign that Stephen Harper or Tim Hudak are about to march to the CN Tower anytime soon. 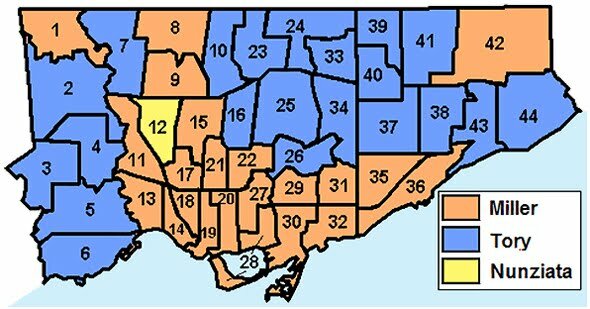 This theory becomes ever shakier when you consider the number of conservative incumbents who were tossed out in favour of Liberals in other Ontario cities. 2. It wasn't a case of Ford winning by default or because other campaigns messed up. This election was all about Ford from start to finish. 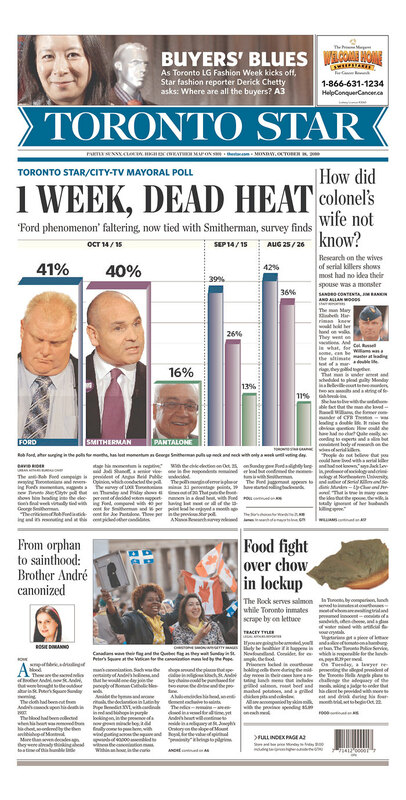 If voters truly didn't want Ford, they had plenty of time to switch their vote to Smitherman. If they didn't like Smitherman, there was plenty of time for a third candidate to emerge, the way a third candidate emerged (and won) in Calgary when voters were underwhelmed by the two front runners. 3. It wasn't Joey Pants' fault. If you look at the numbers, Pantalone wasn't the difference in this one. Even if he drops out, Ford still wins. And it wasn't like Ford came out of nowhere - everyone knew that voting for Pantalone meant they were tacitly endorsing Ford for mayor, and they were cool with it. So what was last night all about? Part of it was the anti-incumbency craze which is sweeping the nation. Toronto voters, especially those in the suburbs, were fed up with waste at City Hall and felt the suburban car crowd was being ignored. Ford played on that sentiment beautifully. What's your plan for snow removal Mr. Ford? 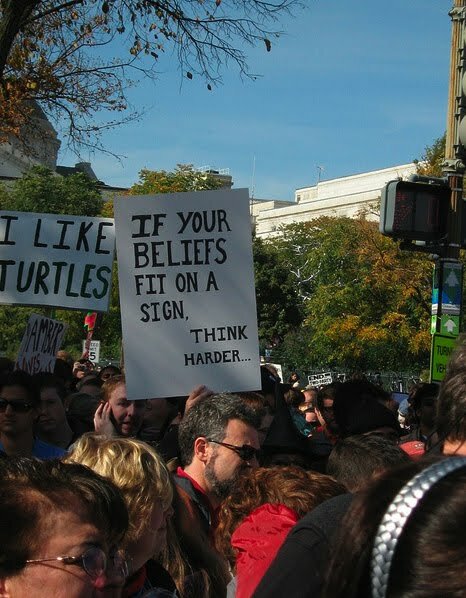 In politics, if you get a powerful message, you stick to it. And Ford did just that. So that's the "right message, right time" part of the equation. The real question is how on earth an inarticulate hot head who opposes immigration to Toronto and has been charged with everything from drunk driving to spousal abuse could be the "right person"? Well, for starters, he had credibility on the waste issue due to his track record of not spending from his council expense account. 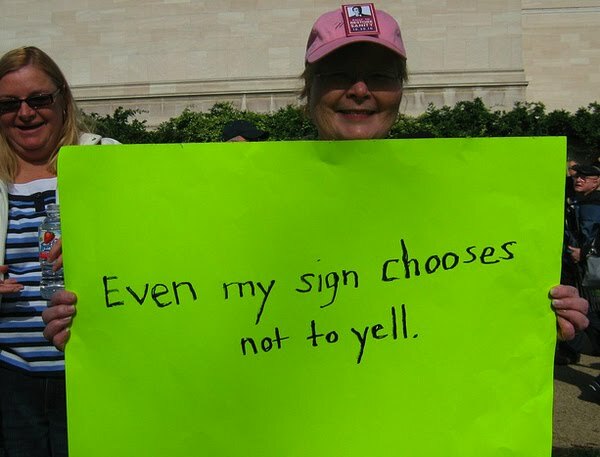 Having the right message isn't enough if you don't have credibility on it. Given Smitherman's track record at E-Health, he wasn't perceived to have the same level of credibility on this issue as Ford. Ford also has the rarest of qualities in a politician - he comes across as genuine. Because they saw him as a real person, voters looked past the shaky math and were willing to forgive his many, many, many shortcomings. Ford reminds me more and more of Ralph Klein with each passing day (right down to the incoherent red faced victory speeches), which is why he cannot be underestimated. I know the common sense is that he'll be a disaster and will be O'Brien'd in 2014. 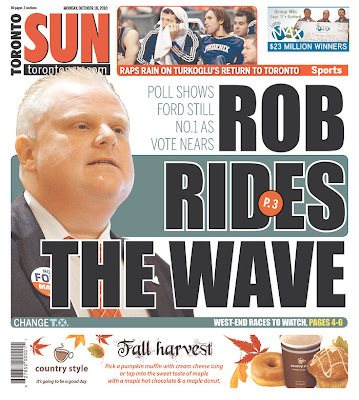 But so long as Ford stays true to what got him this far, voters may very well continue to forgive. Ralph Klein had a good run and it's incredibly presumptuous to assume Ford won't be around to exasperate us downtown Toronto Liberals for many years to come. Can we all at least agree that scan-tron voting takes all the fun out of election night? 11:15 pm: Sorry for the delay in status updates. 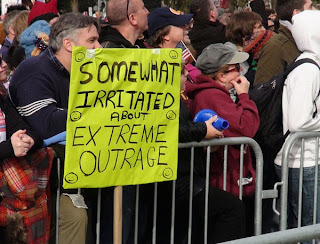 Us elitists can get sidetracked from important tasks like blogging, when filled with rage (and fine wine). As for the results...well, Ford ran a good campaign. I'll have more on that tomorrow. 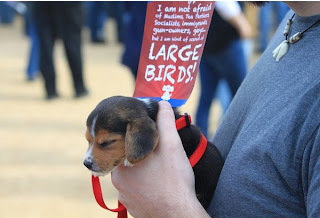 For now, I think it's important for progressive Torontonians to keep things in perspective. There's only so much the mayor can do - he won't be ripping up the streetcar tracks any time soon, or cancelling the Toronto marathon. Plus, this is good news for McGuinty - it gets the "angry protest vote" out of everyone's system and gives McGuinty a possible stalking horse to run against in a year's time. This wasn't a conservative wave sweeping across Ontario - many progressive candidates, including Maurizio Bevilacqua and Jim Watson, won tonight. While the results aren't shocking - I'd predicted a Ford win - it does leave me a big bafflegabed. I mean, I leave Calgary and now they've got Naheed Nenshi and I'm stuck with Rob Ford. I feel a bit like Eeyore with the conservative rain cloud following me around. 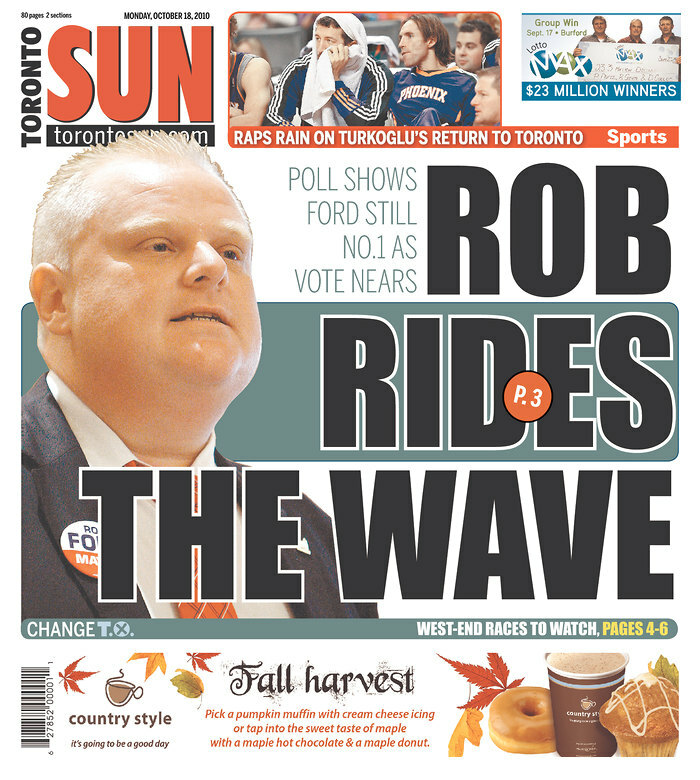 8:10 pm: Ford wins. Well, that was anticlimatic. 8:06 pm: The downside of the scan-trons is that you get results right away. With a third of the polls in, Ford has built up a massive 51% to 31% lead. 7:30 pm: My fellow Toronto elitists have begun arriving...we've already had to open up a second bike rack for overflow parking. The wine is chilling, the hors d'oeuvres are cooking, and the recycling boxes have been placed out for everyone. The fun is about to begin! 7:08 pm: Fun drinking game for tonight. 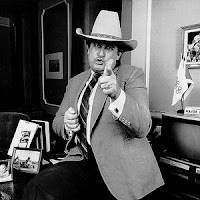 Drink a shot of gravy every time someone talks about "the gravy train". See if you can avoid passing out before they declare a winner. 6:35 pm: My prediction for tonight - Ford 45%, Smitherman 41%, Pantalone 12%. But I'm hoping to be proven wrong. 6:25 pm: Just got back from voting for George Smitherman. 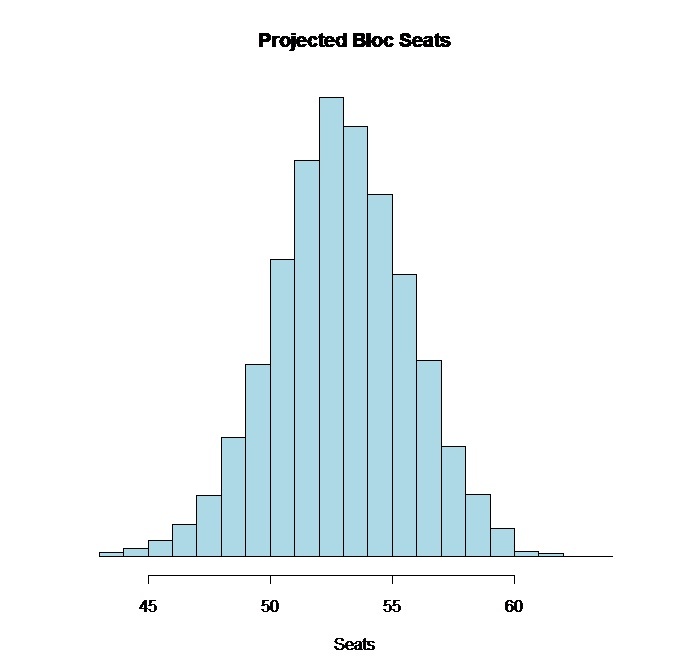 The exciting revelation of the day is that Toronto will be using scan-trons for this election - which means Canadian democracy has finally caught up technologically with most 1994 Grade 6 classrooms. Presumably, this should make for a quick reading of the ballots tonight. Given how close the polls are, this election is going to be all about turnout. So your litmus test tonight is really this - are the lines longer in Etobicoke or in downtown Toronto? The answer to that question will decide the election. For what it's worth, the lineup at my polling station (downtown) seemed about as long as for the federal election. I'll be hosting a "Toronto elitists" election night party tonight and will be live blogging all the festivities and snark, so be sure to tune back in here later. After last week's shocker in Calgary, we turn our eyes to Ontario today, where hundreds of municipalities go to the polls. With polls open for 3 minutes, the Calgary Grit decision desk is ready to call our first election of the night. Congratulations to Hazel McCallion on her 45th consecutive election win in Mississauga! 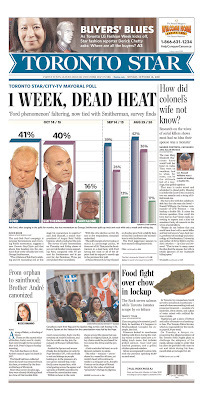 As for Toronto, like all downtown elitists, I'll grab a latte and a New York Times this morning and then head out to the polls to vote for George Smitherman. This isn't just a stop Rob Ford vote - I honestly feel Smitherman is the best candidate in the field, has put forward the best ideas, and would make the best mayor. That said, at this point, I'd be prepared to vote for basically anyone to stop Ford, a man who doesn't have the character to represent Toronto or any sort of coherent plan to deliver on what he's promised. Which is probably a good thing, because a lot of what he's promised would be a step backwards for Toronto (in my humble opinion). So get out and vote Toronto - it's an important election and there are no excuses to stay home. A new NDP commercial hits the airwaves. In it, Jack Layton complains that Stephen Harper gave a tax break to big polluters...then follows it up with a promise to cut taxes on pollution. Yes, that's right. Canada's conservative heartland just elected a mayor who is a visible minority, practicing muslim, Harvard graduate, university professor, and a policy wonk. And he wears purple. Nenshi's rise is truly astonishing when you consider that he was polling in single digits, 35 points back of first, just four weeks ago. Sure, he had a bunch of Twitter followers and had released more policy than anyone else in the race, but the election was all about McIver versus Higgins. The problem was, neither McIver nor Higgins were saying much of anything. 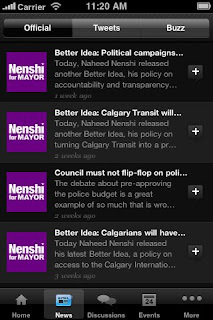 So, poll after poll, Nenshi kept rising. He kept offering solutions to the problems facing the city, while McIver and Higgins argued over the proper amount to increase property taxes by. In the end, Calgary voters showed they weren't hung up on image, on name recognition, or on political affiliation. They voted for the best candidate, and the best candidate won. 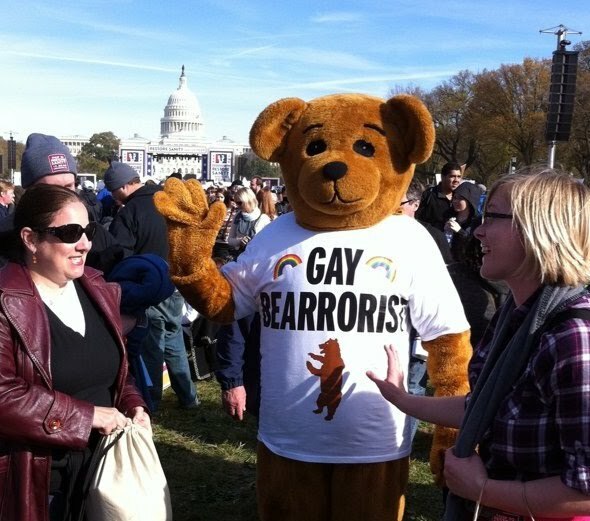 This was a good day for democracy. 10:03 pm: Bad sign for Ric McIver. The volunteer they send out to speak on his behalf calls him "MacGyver". 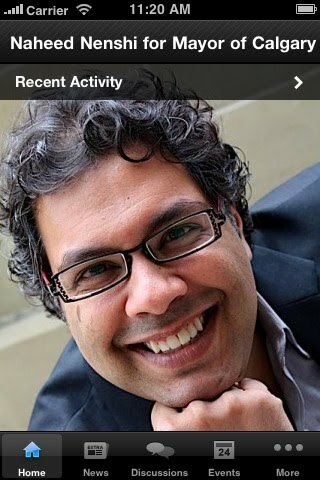 At this point, it may take MacGyver to get Ric out of the mess he's in, because Nenshi keeps pulling away. 9:58 pm: The Nenshi HQ numbers have him up around 13,000 to 9,000 (McIver) to 8,000 (Higgins) based on their scrutineer numbers. 9:48 pm: Well that didn't take long. Higgins falls down to third as McIver's home ward (12) and downtown north (ward 7) come in. But the far south wards (McIver country) and the city centre/NE/campus wards (Nenshi country) are still to come. I still think Higgins might wind up in third when all is said and done. 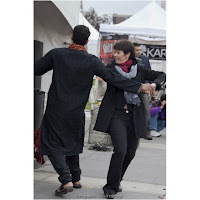 8:59 pm: ...and CTV is going to "Dancing with the Stars". Because, yeah, it's been an exciting election and all but, at the end of the day, we all really want to know how Bristol Palin is doing. 8:49 pm: Steve Mandel projected to be re-elected as mayor of Edmonton. 8:46 pm: CTV shows us the race in Pincher Creek - Rob Buckner is wearing a ballcap in his official campaign picture. The Calgary Grit decision desk is going to call that race for Bucker right now, with 0% of polls reporting. 8:21 pm: We have results! The first poll is in...presumably from Barb Higgins' street. Barb has 26 votes, giving her a 20 vote lead on Naheed. 8:09 pm: Darrel Janz is wearing a purple tie on the CTV broadcast. Is this a slight to his old co-host? 7:45 pm (mountain time! ): I'm coming to you live from the Calgary ex-pat election night party in Toronto, surrounded by purple t-shirts, Barb Higgins haircuts, and Ric McIver action figures (pull the string and he says...nothing - just like Ric!). I'll be updating the results and adding commentary as it comes in, while dishing out the numbers on aldermanic races and maybe even some Edmonton results. Hell, you might even get some hockey scores and weather forecasts while I'm at it! 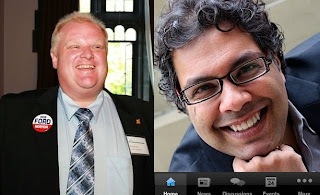 While you wait, you can read my profiles of the candidates (here, here, and here), my endorsement of Nenshi, and my consternation at how Rob Ford could be the next mayor of Toronto and Naheed Nenshi could be next mayor of Calgary. Today, Calgarians cast their ballots for mayor. Well, some Calgarians will. The City has a well deserved reputation for being one of the most apathetic when it comes to democracy - one-third of Calgarians voted in 2007, one-fifth in 2004. This time around, there are no execuses to stay home. Calgarians have close to a dozen legitimate candidates for mayor to choose from. And Oscar Fech! More importantly, there's a real race for the top, with three very different frontrunners in a statistical dead heat for the top prize. While I don't have a vote, I actually like all three of the candidates at the top. Sure McIver is a Conservative, but he's not a scary socon or a buffoon, and he certainly has the experience to make a good Mayor. Higgins brings an outsider's perspective to the race and would be a great representative for Calgary. She's well spoken, affable, and likable. Had she committed herself to running for mayor earlier and developed a coherent vision for the city, there's little doubt she would have won. Then there's Naheed. 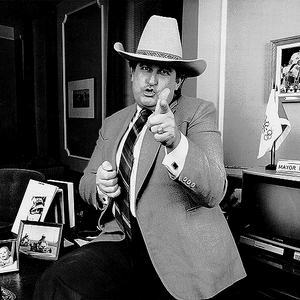 I won't call this an endorsement, because candidates I endorse usually don't do very well, but if I were living in Calgary today, he'd have my vote. 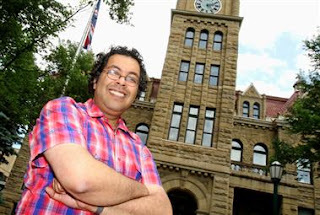 Quite simply, a win for Nenshi would be a win for substance over style. Naheed has run an issues-based campaign from the start, releasing his "better ideas" throughout the summer. 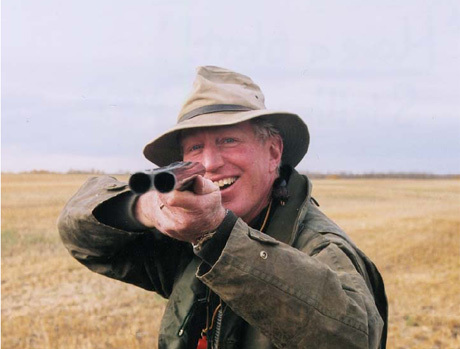 The man has been writing about how to make Calgary a better city for years and he may finally get a chance to do that. He understands city council and city planning better than most of the current councilors, yet at the same time he'd be coming in as an outsider, ready and willing to shake things up and break Calgary free of the NIMBY mindset that has plagued City Hall for years. Naheed is brilliant and has, hands down, the best ideas of any candidate on how to run Calgary. So, of course, he will not win. So come on Calgary - prove me wrong! NOTE: I'll be live blogging the results tonight once the polls close, so be sure to tune in. The Sun has never shied away from taking a bold stand when we believe it will benefit Calgarians. We believe Naheed Nenshi should be Calgary’s next mayor. He’s a prof at Mount Royal University, but doesn’t engage in the egghead bafflegab we’ve come to expect from some academics. On Thursday, I warned Calgarians their city was going soft. I won't issue the Sun a similar warning, but endorsing professors in political races is the first step on a slippery slope...if they're not careful, the sunshine girl may soon be replaced with a page of book reviews or some other elitist nonsense. Even though I only had time to profile four of the candidates running for mayor in Calgary (McIver, Higgins, Nenshi, and the since withdrawn Kent Hehr), I don't want to completely overlook the other candidates. 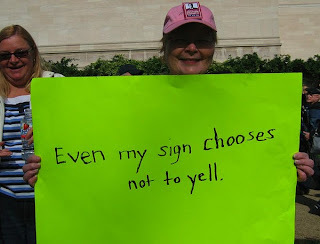 Some of these men and women have good ideas and they deserve a chance to be heard. 1. What is your number 1 priority as Mayor of Calgary? Without Financial resources, the City has their hands tied on everything else. Clean up the financials 1st and foremost - stop wasteful spending, take stock, then get on with fixing the problems and finding the opportunities for Calgarians. Triple E City Hall – Efficient ( doing things right) Effective ( doing the right things) and Ethical ( for the right reasons). Of any Candidate, I have the best Financial credentials ( know what questions to ask) Entrepreneurial outlook ( turning lemons to lemonade -vision and troubleshooting skills), Political relations( good relations with the City as former Alderman, good relations with Province as former MLA) and Track Record of actual achievements that have transformed communities ( Marda Loop), accomplished what others could not ( Legalize secondary suites, solve 30 years battle over Stampede Park expansion, etc.) 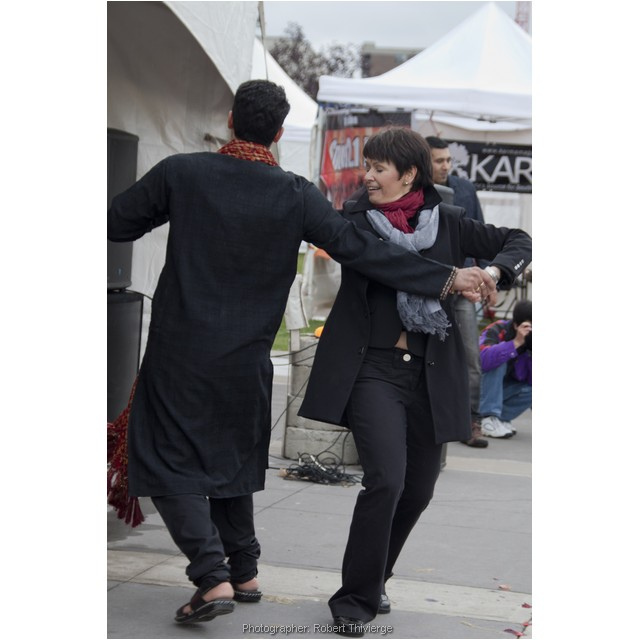 and transformed the culture at City Hall ( World Environmental Achievement Award for Calgary, of which my ISO14001 initiative was instrumental). 2. 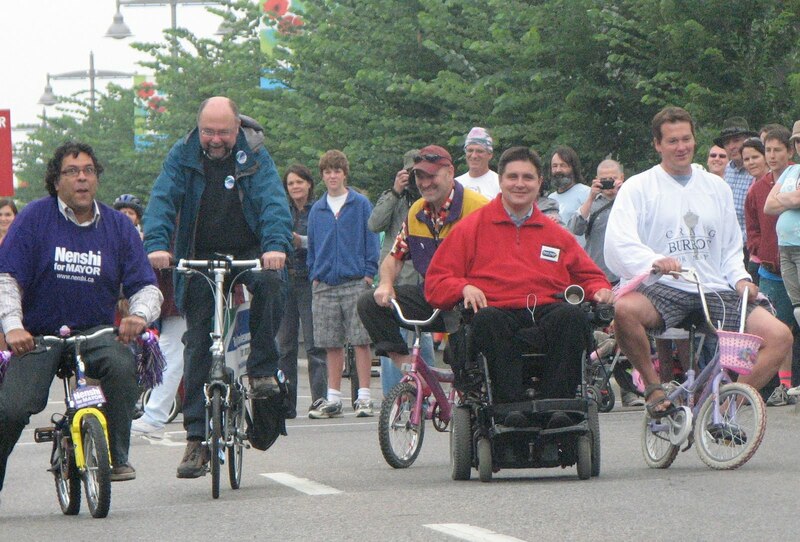 What is one smaller concrete change you would make as Mayor that Calgarians would notice in their day to day lives? A kinder, gentler Parking Authority – or maybe more better snow removal. 3. I doubt you've had much time to relax during this campaign, but if you had the chance to take 1 restful politics-free day, how would you spend it? Catching up with my family – have a BBQ or something. Transparency, accessibility and accountability at City Hall. See my policy attached. Smartcard technology to eliminate the $3 park n ride fee. I would spend the day with my wife and my dog, Max, and then later take my wife to dinner and a movie, I owe her many such days and nights! To give all Calgarians a true voice at City Hall. 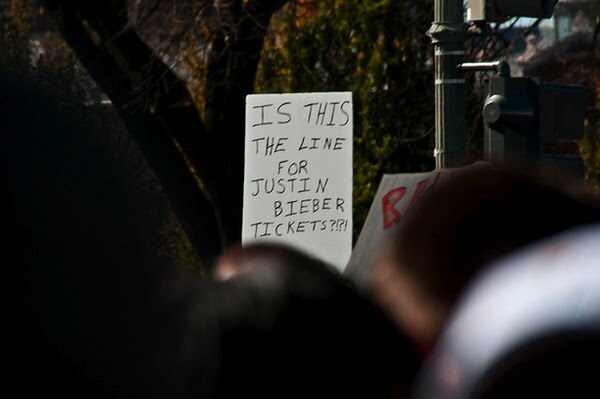 I don't believe Calgarians are heard. I would introduce a crowdsourcing process to have groups address issues that most affect them, discuss them openly, and provide solutions to City Hall. I believe Calgarians hold many answers to our challenges as a growing city. Introduce a Community Liaison position such that communities have a direct ear to the Mayor. I believe communities are the backbone of neighborhoods and represent issues on behalf of their neighbours. But City Hall has never set a process in place that these issues can be heard by Council and particularly by the Mayor. By starting at these grass roots level discussions, I believe it will make a difference in people's lives. Rollerblading on our great pathway systems. And later when the snow flies and the campaign is over, skiing. a. Get work started on the Airport/96th Ave underpass (aka tunnel) as quickly as possible to provide vital East-West link to keep airport access and so we don’t lose the opportunity now to establish the foundation for LRT to airport in the future. While this may not be the overall #1 priority, it is most time-sensitive one and we will miss the opportunity to build it if we don’t start now. b. Fix City Hall. We need a major structural shift at City Hall - we must shift the culture from one of regulator to that of facilitator. It will take time, it will be difficult, but we must start this immediately to get Calgary on track for the future. 2.What is one smaller concrete change you would make as Mayor that Calgarians would notice in their day to day lives? I would get the express bus system to post secondary schools and major employment areas as quickly as possible – getting more people to school and places of employment faster to make Public Transit more a preferred choice is a big priority that will help many Calgarians. I’d start by sleeping in, having a great brunch and then spending some time with family and friends and then head out the theatre to see a performance. This is actually a very well done video, continuing what has been a very strong 3-4 month stretch for Ignatieff and the Liberals. 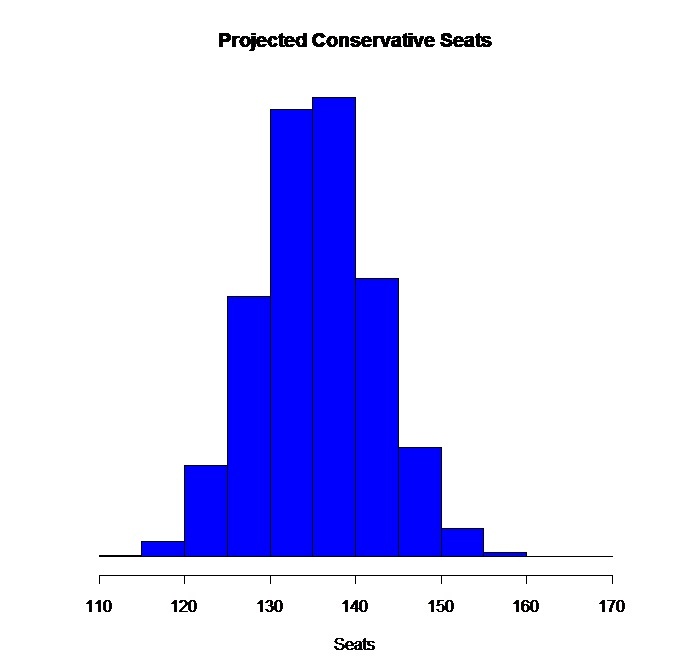 The benefit of this model over other projections is that this gives you a robust prediction that smooths out some of the blips you get when you only use the last election as your benchmark (like the Greens projected to win a seat in Atlantic Canada), it's completely objective, and it takes "election day swings" when the polls are all off into account. New this wave, I've assigned a two week "half life" to polls, which means a poll released this week is worth twice as much as a poll released a fortnight ago (assuming the sample size is the same and the "pollster accuracy" rating is the same). It's NOT a prediction of the next election, but reflects what we could expect if the election were held today. 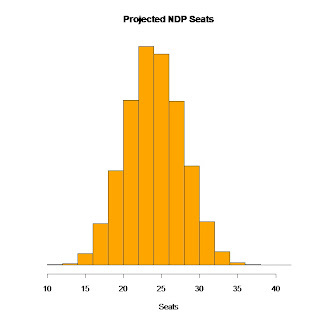 On average, the Liberals are up 13.5 seats from July, with the Tories down 4.2, the NDP down 7.2, and the Bloc down 2.2. The largest gains for the Liberals have come in Ontario (up 9.4) and in BC (up 2.9). The Liberals "best case" scenario (upper end of 95% confidence interval) in Ontario has increased from 47 seats in July to 59 seats now. The odds of a Tory majority have dropped from 1.6% down to 0.4%. 1. Julian Fantino will be the Tory candidate in the upcoming Vaughan by election. As for when that will occur, Pundits Guide speculates that the 5 upcoming by elections will be called for a December 13th vote. 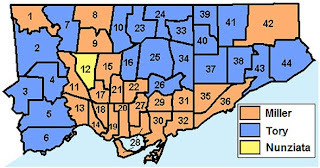 So how will the Vaughan by election go? 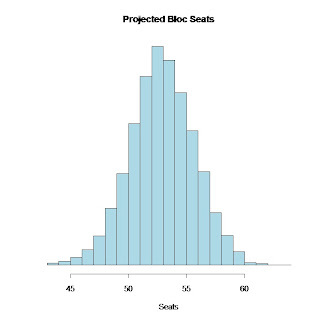 Well, in my updated Seat Projections (to be posted tomorrow morning), I peg the riding at a 91% chance of going Liberal and 9% of going Tory if a general election were held today. But let's remember, by elections have a life of their own, and Fantino is a legit star candidate, so you almost have to handicap the Tories as slight favourites in this one. 2. The Globe and Mail applauds Ignatieff's Family Care policy (as do these people). 3. The Ontario PCs have launched pre-election ads. 4. Canada has lost its bid for a seat on the UN Security council. And the Tories have found a way to blame this one on Michael Ignatieff - huh. Let's all be grateful Canada won Olympic hockey gold this year, or else I'm sure that loss would have been Ignatieff's fault too. Either way, I don't see this as a big vote turner. Foreign policy rarely is. But it's still an embarrassment for Harper, no matter how you spin it. The quote above is from Maxime Bernier, as part of an eloquent defense of the long form Census. But before we get there, it's fun to follow the bouncing ball and see how that old quote found the light of day. "Insisting you follow the law is state coercion"
"Large sample sizes make up for biased samples"
Anyways, Tony took offense to this headline, calling it a "Star Torque" on Twitter. Barton: "Mr Clement, there were never a 1,000 emails about the census..."
Clement: "Well, I can't speak for Maxime Bernier, but I can tell you that if you have a complaint about the census the last place you're going to complain about is to the census people. You're going to complain to your MP." Barton: "I know, but if you're the industry minister and you were getting 1,000 complaints a day of whatever nature about the census, you would have told Statistics Canada, 'Hey, there's something going on here, people aren't happy'?" Clement: "I can't speak for past industry ministers. They have to speak for themselves. 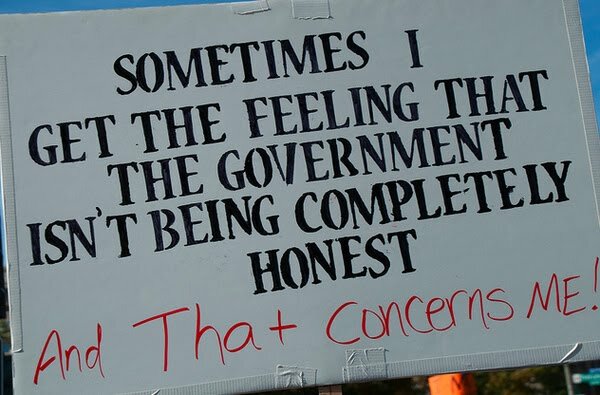 But all I can tell you is, that it stands to reason that if you have a complaint about the coercive tactics of a government agency the last place you're going to complain about that is to the government agency. You're going to complain to your duly elected local MP." Barton: "But then why aren't people tabling all those complaints? 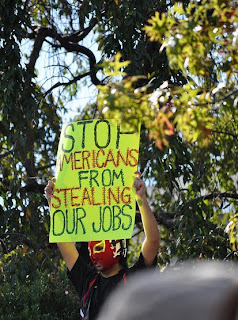 because we don't have them." Clement: "I got a letter in my question period book from a Liberal MP from Richmond Hill who complained to the minister about that very topic. So to say they don't exist is not true." Barton: "But they're not in the hundreds, they're not in the thousands..."
Clement: "I can't quantify. Even if there's one complaint, if it's a legitimate complaint, even if there's one complaint from a Canadian about the coercive tactics used by a government agency we have to consider that complaint a valid question about public policy." Barton: "Sure, but we don't change public policy for one person do we?" Clement: "Why not? If they're right." Barton: "We change public policy for one person?" Like I said, this isn't really sillier than anything else Clement has said before, so I was ready to let this one pass without a blog comment. But notice this toss-away line from Clement: "I got a letter in my question period book from a Liberal MP from Richmond Hill who complained to the minister about that very topic". Now, presumably this letter was given to Tony by a staffer in either his or Bernier's office. I guess it didn't occur to them to see what Bernier wrote in response. "I can assure you that all of the information collected by the census is needed and is used only for statistical purposes. Statistics Canada takes very seriously its legal obligation to protect the privacy and confidentiality of every census respondent. In fact, all census databases, facilities, and networks containing confidential data are physically isolated from any networks outside Statistics Canada. In addition, names, addresses, and telephone numbers are not included in the census dissemination database to protect the privacy of census respondents. All of the questions are designed to meet important information requirements that would be extremely difficult to satisfy efficiently from other sources." 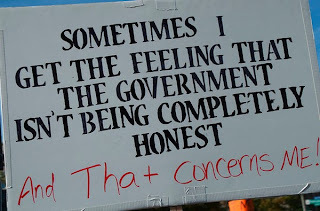 These questions continue to be essential for providing the information needed by governments, businesses, researchers and individual Canadians to shed light on issues of concern to all of us - employment, education, training, transportation, housing, immigration, income support, pensions for seniors, transfer payments, aboriginal issues and many more." Yes, that's the very same Maxime Bernier who claims he got "thousands of complaints each day" about the Census back in 2006. Then backtracked. 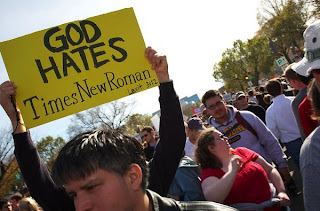 Well, at least now we finally have proof of at least one complaint. This is just another example of how badly managed this issue has been from the start. Just when the story should be dying down, Clement and Bernier do their best to breathe new life into it. Now, I'm sure some of the friendly anonymous commentators who frequent this blog will point out that Wilfert is just as hypocritical on this as Bernier. But at least Wilfert has a defence - the Liberal position has never been that there are no complaints. After all, only Tony Clement seems to believe that one complaint justifies a reckless change in public policy. OTTAWA — A strong majority of Canada's federal politicians, stung by their own embarrassing behaviour in Parliament, have decided it's time to cut back on the shenanigans of question period. On Wednesday evening, MPs voted by a 235-44 margin to pass a motion proposed by Conservative MP Michael Chong designed to elevate the deteriorating decorum in the daily 45-minute session. Chong's proposals now go to committee, where MPs will spend 6 months hitting each other over the head as they study and debate them. For more on reforming QP, the Public Policy Forum has some ideas up on their website, and a poll showing what Canadians think about QP. I've spent most of the past year and half clamouring for Michael Ignatieff to show Canadians what he, and the Liberal Party, stand for. So I'm very pleased to see some tangible policy ideas being put forward with today's Family Care announcement, which will make it easier for Canadians to care for their sick loved ones at home. It's a positive policy. It's on an important issue. It's about families. It connects to people and is something they can understand and relate to. All in all, this one is a winner, and it's great to see the Liberals puting ideas out there before the election campaign. OTTAWA – Liberal Leader Michael Ignatieff today announced the Liberal Party’s plan to stand with Canadian families by helping family caregivers with the cost of caring for sick or aging loved ones at home. “Families look after each other,” said Mr. Ignatieff. “Canadian families want to shoulder the responsibility of caring for their loved ones at home, but they also want a government that stands with them. “Our Family Care Plan reflects the value of family caregivers – their value to our economy, our health, our families, and our communities,” said Mr. Ignatieff, who made the announcement at the home of a caregiver who has spent her life savings to care for her husband, who has a rare form of cancer. Sure, guys like Bob Hawkesworth and Wayne Stewart are still in the mix but...well...life is too short to blog about Bob Hawkesworth. As such, this will be the fourth and final instalment of my 2,372 part series profiling mayoral candidates. Barb was born in Edmonton - something which will no doubt form the basis of nasty attack ads should the campaign get dirty. At the age of 27, she took over as an anchor at CTV Calgary News. 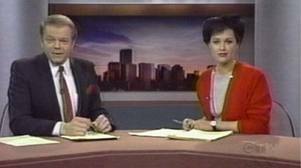 For the next 21 years, Higgins and her co-anchor, Darrel Janz, were among most recognizable Calgarians around. Higgins was a latecomer to the mayoral race - she declared in early August to much fanfare, but her campaign has yet to take off. Early on, she was criticized for lacking substance and concrete plans. Last week she axed her campaign manager, Don Lovett, replacing him with Alan Hallman. Regardless of what you think of Lovett or Hallman, replacing your campaign manager mid contest is not the sign of a healthy campaign. Higgins' site covers the bases. 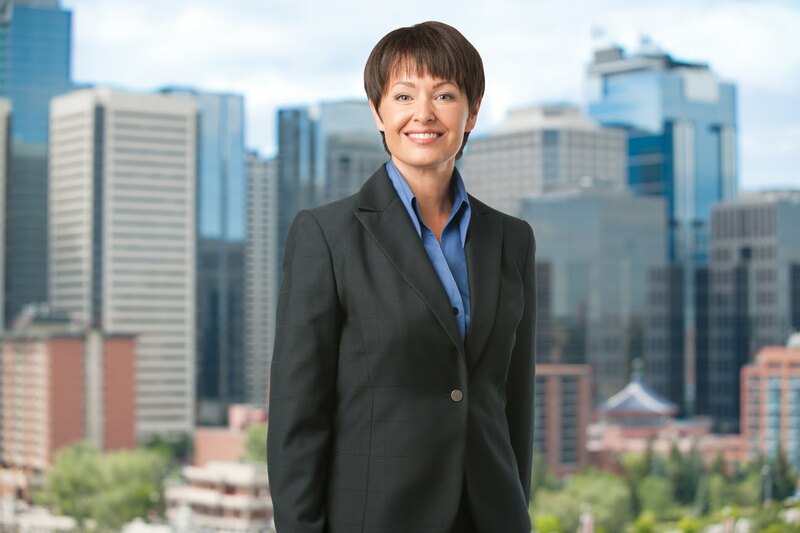 Candidate's picture in front of Calgary skyline? Check. Easy to donate or tell a friend? Check. Visible link to her platform? Check. YouTube intro and social media links? Check. Much like the candidate, there isn't a lot to get excited about, but the site serves its purpose. I would like to see business taxes reduced. I would not go so far as to eliminate business taxes because that would mean a drop in revenues to the City of $150 million, and I do not think the City has the capacity to do that at this time. I would add, however, that I have had good discussions with the Chamber of Commerce and as mayor would seek to develop an ongoing dialogue between the Mayor’s Office, City Council and small and medium-sized businesses to make the right decisions about business tax rates. Almost all of our amateur sports and recreational facilities are at or over capacity. I am committed to working with our amateur sports community to expand these facilities, in particular for minor hockey and minor soccer. Yes, it's not any less bold than anything that has come out of the Ric McIver platitude machine. But it's not any different. And therein lies the problem. When you're in second place behind a competent and well organized campaign, you need something to differentiate yourself. At this point, the only real area of disagreement between Higgins and McIver seems to be on property taxes, with Higgins wanting them to be slightly higher than McIver. Hardly the stuff that will encourage one of the most apathetic electorates in Canada to vote for you. 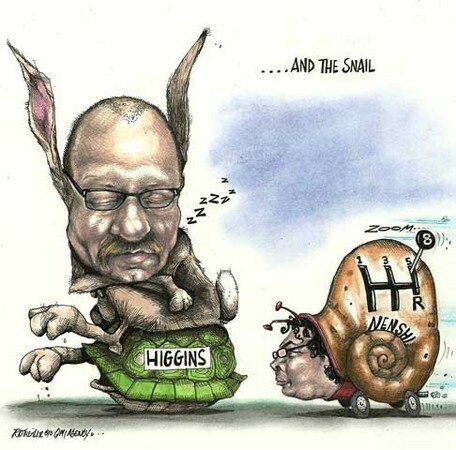 With two weeks to go, the smart money is on a strong second for Higgins. She'll most likely need a game changer to pull this one out, especially if Nenshi continues to drain votes off the left.